New pro-business leaders in both Venezuela and Argentina face a conundrum. Unsustainable social spending by the leftist opponents they have just defeated has helped crater the economy in both countries. Addressing that without sparking unrest or wrecking their own credibility will be no mean feat. Any reform will be a battle in Venezuela, where the Democratic Unity coalition won at least 99 of the National Assembly’s 167 seats on Sunday. Socialist President Nicolas Maduro, whose term in office expires in 2019, may try to use other institutions he controls to stymie any legislative initiatives. That could prompt lawmakers to pursue a recall vote to oust him next year. 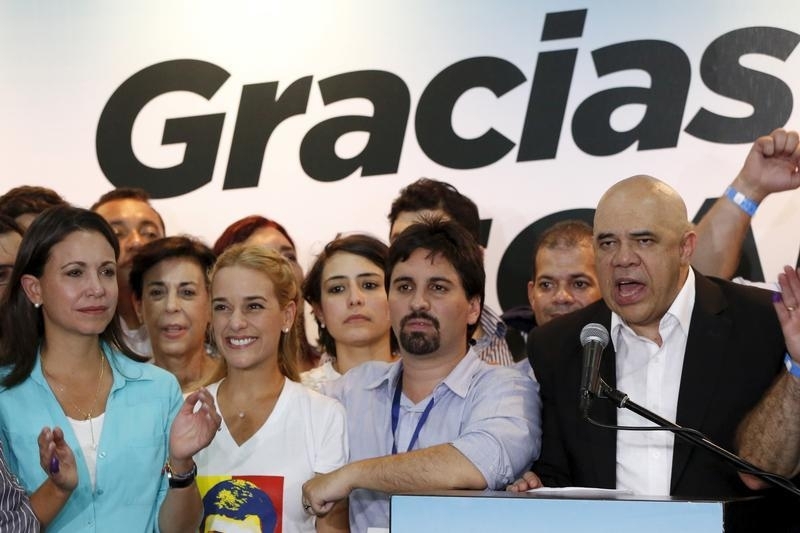 Perhaps mindful of not alienating voters ahead of that, opposition leader Jesus Torrealba says the coalition will not dismantle highly popular welfare programs, even as it pushes to reform the central bank and roll back nationalizations. Venezuela’s economy, though, is expected to shrink 10 percent this year, according to the IMF. Its triple-digit inflation is the world’s highest and oil revenue, which accounts for virtually all hard-currency income, has fallen drastically since last year. Pushing for spending cuts may prove unpopular, but failing to do so risks sharing the blame for the economy’s continued dreadful state. Argentina’s incoming President Mauricio Macri will have more power than the winners of Venezuela’s election when he takes office on Dec. 10. But he faces a similar calculus. The fiscal deficit is ballooning, inflation is in double digits and reserves are dwindling. Macri plans to undo capital controls that have propped up the peso and seek a deal with U.S. creditors suing Argentina over unpaid debt. If his plans work, some of leftist predecessor Cristina Fernandez’s social programs may still prove affordable. If they do not, cutting them could spark unrest. Populist leftism may be on the retreat in Latin America – even Cuba may soon reach a Paris Club debt settlement and is pragmatically improving U.S. relations. But it’s not going quietly. Maduro and Fernandez are likely to fight tooth and nail to defend social gains. How Venezuela and Argentina fare will be a useful primer when Brazilian voters head to the polls in 2018 to pick leftist President Dilma Rousseff’s successor – assuming she survives impeachment efforts in the meantime. Venezuela’s pro-business opposition won a majority in the 167-seat National Assembly in elections held on Dec. 6. Opposition leaders vowed to use their new majority in Venezuela’s legislature to free jailed opponents of the Socialist government but also said they would not dismantle popular welfare policies. With 99 seats secured so far to the ruling Socialists’ 46 - and results not yet in for the remaining 22 seats - the opposition looked certain to reach at least a three-fifths majority. That means they could in theory have the power to fire ministers after a censure vote. If the opposition secures two-thirds of the seats, it could try and shake up institutions like the courts widely viewed as pro-government. Even with just a simple majority, it can exercise control over the budget, begin investigations that could embarrass the current government, and pass an amnesty law for jailed politicians such as prominent opposition leader Leopoldo Lopez. Venezuelan sovereign bonds as well as those of state oil firm Petroleos de Venezuela (PDVSA) rose as much as 4.2 cents on the dollar on Dec. 7 as investors hoped for at least some economic reform in the crisis-ridden country. The IMF expects the Venezuelan economy, undermined by falling oil prices and the statist policies of late President Hugo Chavez and his successor Nicolas Maduro, to shrink by 10 percent this year and 6 percent in 2016. Maduro’s term runs until 2019. Pro-business opposition challenger Mauricio Macri won Argentina’s runoff presidential election on Nov. 22, ending more than a decade of leftist rule under Cristina Fernandez and Nestor Kirchner, her late husband and predecessor as president.